A solid organ with handy effects. Let down by chorus emulation. Yamaha made some interesting YC-badged transistor combo organs back in the '70s and the Reface YC is a throwback to those heady times. This time round, however, despite the Reface YC being red like its older relations, the sound generation is based on Yamaha's well-respected AWM sample-based synthesis rather than using transistors and complex wiring. Using the marvels of modern technology, the tiny 2015 YC features not just Yamaha organs but all the classic organ types you could want including emulations of the legendary tonewheel Hammond (H) and transistor organs such as those from Vox (V), Farfisa (F), Yamaha YC-45D (Y) and the vaguely-named Japanese Transistor (Acetone) organ (J). Build quality is solid and like the other Reface models, the YC features speakers, USB, MIDI, and an Aux input, plus a surprisingly playable 37-key mini keyboard (three octaves). 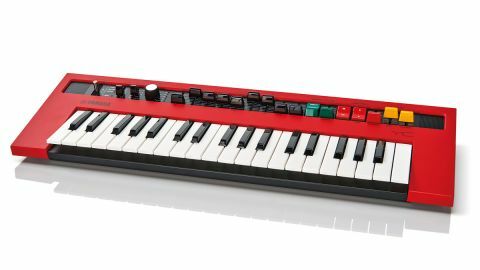 The action feels like a miniaturised Motif-series synth-action keyboard (which is what it is!) and our sausage fingers had no problem playing it, though we would have preferred a four or five-octave mini-keyboard like those found on the DX100 or Portasound PSS-680. To keep things authentic, the keyboard isn't velocity sensitive when controlling the internal engine, but velocity is transmitted over MIDI which is great for controlling external instruments. Also, while on the subject, the YC makes a decent mini MIDI-controller as all the front panel sliders and switches send and receive MIDI CC information - if you're looking for a compact MIDI controller with plenty of front panel control, the YC is therefore worth a serious look. There's a versatile set of organ emulations onboard, however for this review we're going to focus mainly on the Hammond Tonewheel emulation as we dare say for most folks, it's going to be the most-used model. First off, the basic sound (without the onboard rotary-speaker emulation engaged) is solid and nicely authentic, though definitely on the clean side as there's no options for adjusting key-click or tonewheel leakage. As you would expect, there are nine 'footage' sliders (like drawbars on a Hammond) enabling you to fade in harmonics to fill out or thin out the sound on the fly. These sliders all feel solid and the short throw helps you to make adjustments quickly, though unfortunately there's no way to store your sounds onboard once you hit upon a great sound (though you can connect an iPad or iPhone and use Yamaha's iOS Capture App). The rotary-speaker emulation is very usable, reminding us a lot of the emulations onboard the Motif-series. However, while the emulation sounds authentic at slower speeds (and it's great that there's a 'stop' function too which allows you to have the dry rotary sound without the spinning of the rotors), the fast speed sounds a little too fast/wobbly for my liking and also the acceleration from slow to fast is quite abrupt, with no way to adjust the ramp-up time. Effects-wise, the percussion sounds very authentic (and it's great to have a variable length slider for the decay) and the reverb sounds very nice too, adding some welcome musical ambience and atmosphere to the dry sound. The distortion sounds fine and does a nice job of grittying things up, though unlike a real Leslie the grit does tend to sit on top of the sound rather than blend with it naturally. Finally, the vibrato/chorus sounds nicely authentic on the vibrato setting but on our review unit, the chorus setting sounded virtually indistinguishable from the vibrato! Hopefully this can be addressed as soon as possible via an update, as chorus is an integral part of the Hammond sound and it's sorely missed here.